Nvidia CEO says AMD Radeon VII "performance is lousy"
On Wednesday eve, HEXUS covered the AMD CES 2019 keynote hosted by Dr Lisa Su. You can read through our report on the presentation and technology unveiled via the link but most of the goodies people were looking forward to were merely teased; next gen Ryzen processors, and Navi graphics cards. Thus the biggest announcement of the keynote, and a surprise for many, was that of the Radeon VII graphics card. In the days since the AMD keynote HEXUS forum members have been debating the merits of the Radeon VII rather intensely. Opinion seems divided but it is interesting to see that the Nvidia CEO, Jensen Huang, has put his thoughts on the record regarding the new high-end AMD graphics card - not via our hallowed forums but via an interview with PCWorld. The site's Gordon Mah Ung reports that in response to a query about what he thought about AMD's latest graphics card, Huang branded it simply as "underwhelming". I don't know if the Nvidia CEO needed to be prodded to elaborate, but he did anyway. "The performance is lousy and there’s nothing new," Huang said. "[There's] no ray tracing, no AI. It's 7nm with HBM memory that barely keeps up with a 2080. And if we turn on DLSS we'll crush it. And if we turn on ray tracing we'll crush it." Huang didn't feel like stopping there in his AMD technology critique. The Nvidia boss seemed to move onto even shakier territory by slating AMD FreeSync support and monitors. Quite extraordinarily he claimed "(FreeSync) was never proven to work. As you know, we invented the area of adaptive sync. The truth is most of the FreeSync monitors do not work. They do not even work with AMD’s graphics cards." As FreeSync has been tested numerous times by ourselves and various distinguished tech sites, and in HEXUS labs as recently as a couple of weeks ago, (iiyama G-Master GB2560HSU-B1 review) we don't agree with Huang's assertion. PCWorld questions how Huang would know exactly how the Radeon VII would compare to the RTX 2080, for example, as such data isn't readily accessible. A little later AMD's CEO Dr Lisa Su was presented with the comments and diplomatically dismissed Huang's comments regarding the Radeon VII by pondering "I would probably suggest that he hasn’t seen it yet". Moving on from this rap-battle between the two leather jacketed CEOs, it was interesting to read in a subsequent report that Dr Su said, in a PCWorld interview after the keynote, that AMD has its own raytracing GPUs "deep in development," and she hinted strongly that AMD's 3rd-generation Ryzen chips will launch with more than eight cores. 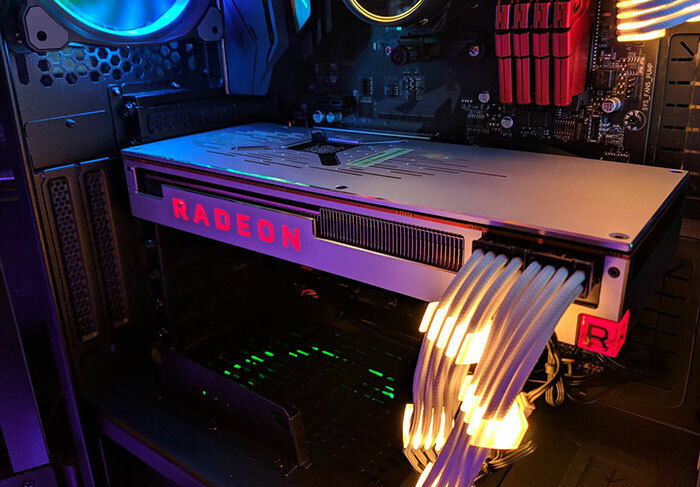 HardOCP has created a table of benchmark results featuring the new Radeon VII by distilling info provided in the AMD press-deck footnotes. You can see in the table, embedded directly below, that the new Radeon VII is compared to the RX Vega 64 in a long list of AAA titles and comes out approx 28 per cent faster on average. This tallies favourably with AMD's keynote assertions. 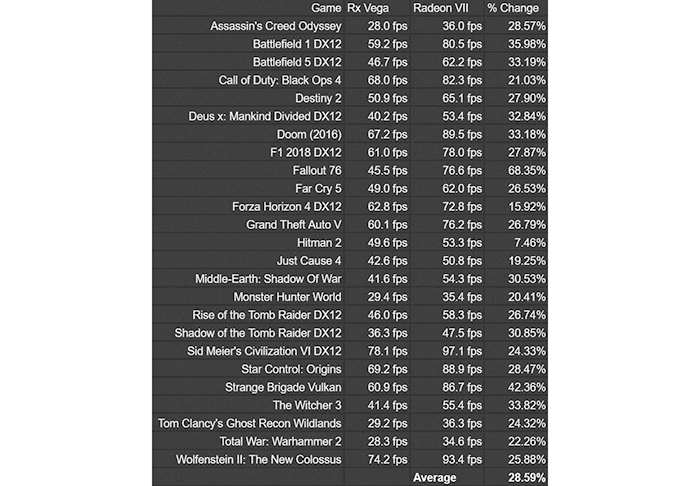 If you take these results alongside the trio of comparisons against Nvidia's RTX 2080 from the AMD keynote (below) it sheds a bit more light on how the other games will compare red-vs-green. The system AMD used for the comparison tests was an Intel i7 7700K rig, with 16GB of 3000Mhz DDR4, Windows 10, and the AMD Driver 18.50, with all the games tested at "4K Max Settings". Whether he's accurate or not with his assessment, nothing says “we're screwed” like a major tech CEO bad-mouthing the competition to the global press. It's like he's been taking lesson from Donald Trump, or something…. Despite my current hardware choices I do want AMD to do well and bring the competition (I used to always have AMD builds back in the day) however he isn't wrong is he, I mean HBM2 and a die shrink on paper should be far more powerful or efficient (or both) than this card actually is. The content creation argument doesn't play out too well in reality either as a lot of processes rely on CUDA cores, we just have to hope they don't mess up with navi or they are in trouble. These comparisons don't even bring DLSS into the mix either where the 2080 is more than likely going to pull ahead by quite a stretch in BFV with that turned on. Poor form for coming out with that but I can agree, obviously we need to see third-party benchmarks but a 7nm card that uses a ton more power and needs that much cooling can only keep up with a 2080 is poor, I can't see a reason for buying it, the 2080 is a better buy and now supports Freesync. This was such a childish response to AMDs keynote. Not becoming of a company in Nvidias position. Whether or not anything he says is correct is tainted by his poor attitude against the competition. Radeon 7 was underwhelming but to do what he is doing and to literally drag down all the competitions tech with his terminology. Something bad must be happening to nvidia if that were the case.